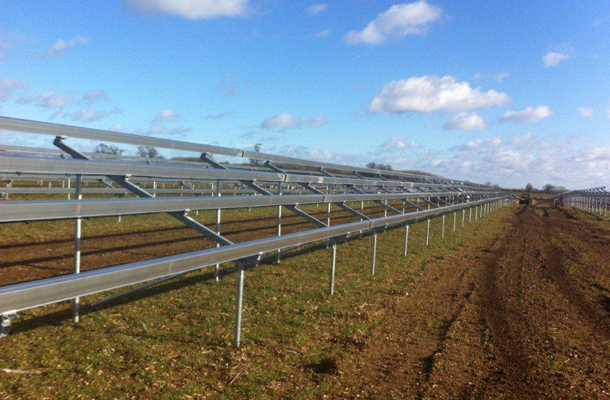 The Krinner ground screw foundation has been used to install over 50MWp of ground mounted solar energy in the UK. This landmark has been achieved together with Krinner UK’s installation partner, JPCS, with over 30MWp installed in the first quarter of 2013 alone, including the UK’s largest solar farm, at the time at 5MWp. Using over 48,000 Groundscrews, ground screw has provided the foundations for around 58 miles of frames and 235 miles of aluminium rails, to mount 185,000 solar PV modules, which is the equivalent surface area of 1400 tennis courts. The 55MWp would have the capacity to power over 92,000 homes, boil 26,500 kettles and run 4.8 million low energy light bulbs. The ground screw foundation is a robust and sustainable alternative to traditional concrete foundations, removing the need for excavation and concreting. Other applications for the ground screw foundation include signage, timber construction, fencing.